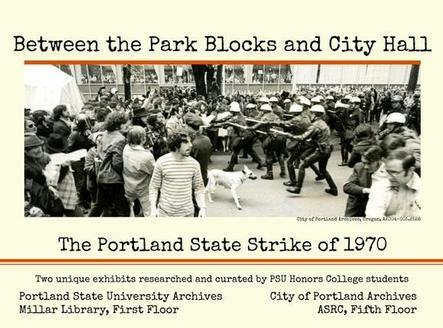 Honors students researched the collections in the City of Portland Archives and PSU Archives to interpret the events of the student strike of May 1970, which began in response to the killings at Kent State University on May 4, and ended in violence as Portland police attempted to remove demonstrators from the Park Blocks. Corinne Rupp, an Honors College student intern, used the seminar’s findings and her own original research in the city and university archives this summer to create the two exhibits on display this Fall term. The City’s exhibit opens Saturday, October 3. On Saturday, October 3rd, get a guided tour of that exhibit with one of the students. The tours are being offered as part of the Oregon Archives Month Celebration and will start at at 12:30, 1:30 and 2:30. Meet your guide at the display on the fifth floor of ASRC.